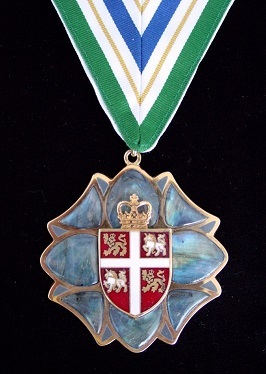 Established in 2001, the Order of Newfoundland and Labrador is the province’s most senior honour awarded for outstanding service. 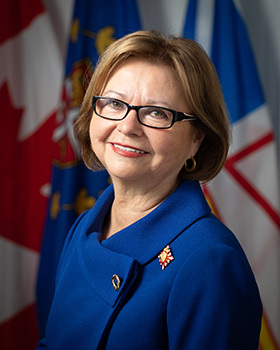 The Lieutenant Governor will receive the insignia of the Order – usually at the installation ceremony – and this is worn on all occasions when it is appropriate to wear orders, decorations and medals. It is worn in addition to other officially granted national and provincial orders, decorations and medals. The insignia of the Order is in the shape of a stylized pitcher plant, which was declared Newfoundland and Labrador’s floral emblem in 1954. The petals are of the provincial mineral, Labradorite. The insignia of the Order has at its centre the Arms of the Province, granted by King Charles I in January 1638. The Arms incorporate some of the most ancient heraldic symbols, the unicorn representing Scotland and the lion representing England.The gold elements of the insignia represent the excellence of achievement that the Order of Newfoundland and Labrador recognizes. The Crown is taken from the official standard of the Lieutenant Governor of Newfoundland and Labrador, the Chancellor of the Order of Newfoundland and Labrador. It symbolizes honour and merit, and recalls Newfoundland and Labrador’s place as a province of Canada, a constitutional monarchy, and as part of the Commonwealth.The colours of the ribbon are those often used in provincial flags and ribbons: The green is evocative of the land and our forests. The white represents the snow and ice that covers much of our province in winter. The blue symbolizes the sea that has shaped so much of our heritage. The gold symbolizes the richness of our province and its people. Granted by the Chief Herald of Canada on July20, 2007, the vice-regal emblem is the primary symbol of authority of the Office of the Lieutenant Governor of Newfoundland and Labrador. The centre of the emblem bears the shield of arms taken from the Newfoundland and Labrador Provincial Arms which was granted by Royal Warrant of His Majesty King Charles I of England on January 1, 1637. The 10 maple leaves symbolize each of Canada’s provinces, while the Crown symbolizes the Sovereignty of Canada and our Head of State, Her Majesty The Queen, whom the Lieutenant Governor represents in the province. Similar emblems are used throughout Canada by other vice-regal offices. Prior to 2007 the Office of the Lieutenant Governor used a plain Royal Crown as its primary symbol of authority; this continues to be used by a number of Governors General throughout the Commonwealth. 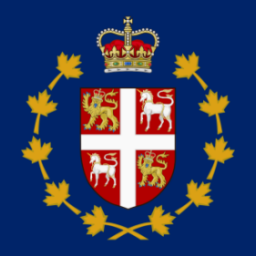 The Lieutenant Governor has a personal flag called the vice-regal flag. This flag is flown on vehicles and at Government House when the Lieutenant Governor is in residence and also on any building or Canadian vessel where the Lieutenant Governor is present. The flag is Royal Blue. It is charged in the centre with the shield of the arms of the Province of Newfoundland and Labrador, surrounded by a circlet of 10 gold stylized maple leaves. Between the two upper levels of the garland, and above the shield is a St. Edwards crown. The Royal Newfoundland Regiment is an infantry unit consisting of two battalions. Its origin dates to April 25, 1795, with its formation in St. John’s as a regular unit of the British army, its members drawn from residents of Newfoundland. The Regiment represents only a portion of a proud history of military involvement in Newfoundland since the 17th century. Newfoundlanders have served in navy, army, and air force units since then to the present day in numbers out of proportion to the size of its population base. The practice of Honorary regimental appointments in Canada dates back more than a century. The Honorary rank is “honorary and advisory.” The role of the Canadian Armed Forces Honorary appointee to the Royal Newfoundland Regiment is to serve as an advocate for the Regiment and the Canadian Armed Forces, and to strengthen the military’s bond with the community. Gules a caribou’s head and neck proper all within a wreath of laurel or ensigned by the Royal Crown proper and set on a scroll Azure inscribed ROYAL NEWFOUNDLAND REGIMENT in letters. The Crown represents service to the Sovereign. The laurel wreath, which symbolizes excellence and achievement, dates back to competitions and combat in ancient Greek times. 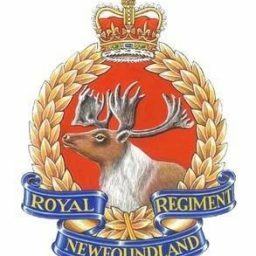 The caribou head is based on the badge of The Royal Newfoundland Regiment of the First World War and which itself was copied from that of the Newfoundland Highlanders, a para-military cadet corps formed in 1907. The claret background was one of the First World War regiment’s livery colours, the other being white. “ROYAL NEWFOUNDLAND REGIMENT” is a form of the regimental title. The Royal Newfoundland Constabulary is the oldest police service in North America and one of only two police services in Canada to carry the Royal designation. With a policing lineage dating to 1729, members of the Royal Newfoundland Constabulary to serve the people of Newfoundland and Labrador. From three Regions – Corner Brook, Labrador West and the Northeast Avalon, the Royal Newfoundland Constabulary works to build safe, secure and healthy communities. The Royal Newfoundland Constabulary as a para-military organization follows military tradition by appointing Honorary Chief’s. The duties and functions of the Honorary appointee are largely representational and advisory and not connected to the daily operations of the Royal Newfoundland Constabulary. As Honorary Chief, the Lieutenant Governor presides over various Royal Newfoundland Constabulary functions such as the Annual Commissioned Officers’ and Senior Managers’ Mess Dinner, the Royal Newfoundland Constabulary Police Exemplary Service Medals ceremonies and the Royal Newfoundland Constabulary Police Studies Graduation Dining-In, Parade and Swearing-In ceremonies. The RNC Insignia consists of a blue ground with a letter C in gold, surrounded by a red garter (ancient order of chivalry) with a gold border, buckle and pendant, displaying the words “Royal Newfoundland Constabulary” the whole surmounted by a Royal Crown in its true colour. The College of Arms, or College of Heralds, was made a Corporation by King Richard III to regularize and supervise the issuing and use of Arms.